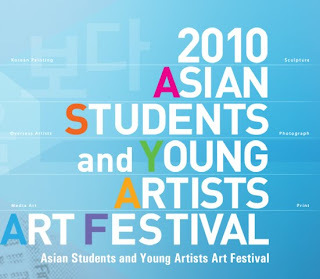 After Seoul Station ("When we first met") and the old Defense Security Command ("We meet the future"), the Asian Students and Young Artists Art Festival (titled "Open your eyes, look up the blue sky") will invade Sungshin Women's University. - Seoul Station, still under renovation, will host a major exhibition space. BTW: Seoul city is looking for pictures of meetings between Korean presidents and Seoul citizens, which used to take place there. - the Defense Security Command will become the Seoul branch of the National Museum of Contemporary Art / MOCA (see "MOCA - Defense Security Command, continued"). BTW : we'll know within weeks the winner among the five finalist projects. As usual (see ASYAAF 2009), ASYAAF will display works from 777 young talents from Korea and other Asian countries, with a break in the middle of the exhibition to replace all items with a new set. And as usual, I strongly advise art lovers to come twice : there's always some good surprise, sometimes where you least expect it, in the darkest corner of the building (see UPDATE BELOW). Two innovations this year : Korean artists abroad are also participating (ie students from les Beaux Arts in Paris), and curators have mercifully decided to ban the kind of embarrassments that plagued previous editions (typically : "photoshop paintings" of realistic sirupy candies which have more to do with advertising than art). I DO NOT recommand the visit this year. To my utmost dismay, this edition of the ASYAAF is an embarrassment : the quality is overwhelmingly low and the few familiar faces didn't save the day. The only artistic note was the ballet of workers painting the walls for the inauguration, hanging from their ropes against Seongbuk-gu skyline.